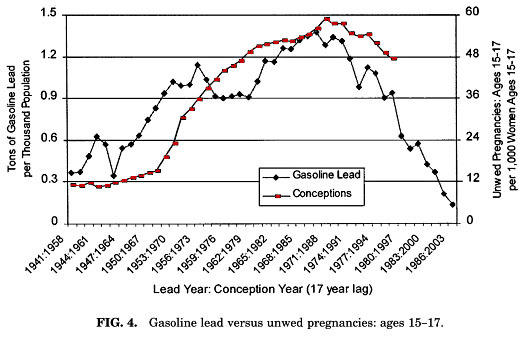 Although other social trends and government policies are often cited to explain the rise and fall in unwed pregnancy and crime rates over recent decades, the role of childhood lead exposure seems to be especially apparent in the best-fit lag structures for gasoline lead regressions. In the case of the unwed pregnancy regressions, the best-fit lag for each bracket is consistent with changes in lead exposure in the first years of life….The fit between the temporal patterns, with lags consistent with the known risks of lead exposure in the first years of life, provide striking visual support for the association between lead exposure and undesirable social behaviors. His “striking visual support” is below. Make of this what you will. Just keep in mind that sometimes neither “traditional moral values” nor economic stagnation provides all the answers. Sometimes you ought to be looking elsewhere.